Damien McCrory will miss Pompey’s FA Cup first-round trip to Luton on Saturday after suffering a minor injury setback. The Burton Albion loanee underwent surgery earlier this month after twisting his knee in the 4-1 win against Fleetwood Town. However, McCrory’s rehabilitation has had a minor hold-up, after returning to training last week. 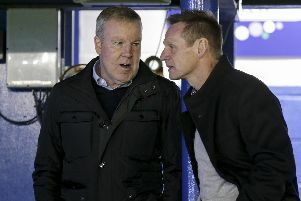 Blues boss Kenny Jackett revealed the Irishman will remain sidelined for Saturday’s visit to the Hatters. Curtis Main (hamstring) and Drew Talbot (groin) are both nursing complaints and will also not feature against Luton. Jackett added: ‘Curtis Main is not back training yet. ‘He might be next week or might be on Thursday, but he won’t be (available) for Saturday. ‘Drew Talbot will also be touch and go this week. ‘He’s had groin problems before and they have led to bigger things for him previously – hopefully he can build it up and stay fit. ‘He’s had a frustrating time with injury and hopefully by the end of this week his body is okay.